Fine Wine Importer Maisons Marques et Domaines marked its 30th Anniversary in style with a tasting at the Institute of Directors, London, yesterday. 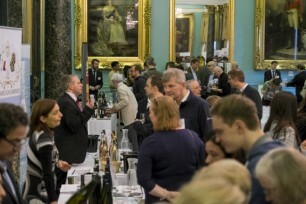 With a record attendance of over 320, guests tasted through the latest releases from the 20 producers, welcoming new additions to the range, such as the Mazzei family’s Castello di Fonterutoli, and the Californian Roederer Estate’s new still wines. To celebrate the landmark year, producers proudly presented an iconic vintage marking a milestone year for the producer or MMD alongside their range; Louis Roederer poured 1996 Brut Vintage, Domaines Ott* and Chateau Pichon Lalande took guests back to 1986 with their Clos Mireille Blanc and Grand Vin from that year, Marqués de Murrieta showcased the 1991 Castillo Ygay, the year they joined the MMD portfolio, while Ramos Pinto treated guests to a 30 Year Old Tawny Port in Jeroboam to name a few. MMD: Established in 1986 as the exclusive distributor of Champagne Louis Roederer, MMD now manages UK distribution for a broad portfolio of 20 high quality, family-owned producers from around the world, all of whom endorse to the Roederer philosophy of excellence and craftsmanship.